The biceps are the most coveted muscle group known to man. Since the first bodybuilding mag ever hit the stands, the biceps has been a showcase muscle and building an impressive set is a big business. Yet, most guys can’t get the damn things to grow. So I’m going to outline the three best biceps exercises to catapult your development. But before I do that, let me explain two common errors. First, the biceps are designed to work with your forearms and upper back. Many machines take those muscles out of the movement so the biceps are left in isolation. The biceps, like most muscle groups, only respond to exercises that challenge them to work the way they’re designed. Just check out the picture in this blog. I used an Olympic rings gymnast for good reason. Those dudes have the most impressive biceps on the planet, but they aren’t bodybuilders that do machine curls all day. Instead, they’re athletes that hang from the rings for hours each day. Exercises on the rings challenge your forearms and upper back, along with your biceps. That’s why their biceps are so incredible – they train them with the muscles they’re designed to work with. Biceps Training Error #1: Training the biceps in isolation. Second, the biceps respond best to high training loads. Guys love to train for a pump, and the best way to get a pump is to do slow-grind sets with high reps. But slow training with long sets don’t overload the largest motor units that have the most potential for growth. You need to do multiple sets of low reps with a relatively heavy load to get the biceps to grow. This is why so many people love the 10×3 (10 sets of 3 reps) approach I often recommend for building a muscle group. The biceps respond especially well to that set/rep combination. Biceps Training Error #2: Training the biceps with light loads and high reps.
With that out of the way, let’s get to the three best exercises that will quickly add muscle. 1. Rope Climb/Neutral grip Pull-up: Of all the exercises I’ve used that overload the biceps, the best one is the least practical. I’m talking about climbing a rope. If you have the luxury of hanging a 2″-2 1/2″ rope from 15 feet up, consider yourself lucky. All you need to do is climb up and down that rope for 10 sets 2-3 times per week and you’ve get all the biceps stimulation you’ll ever need. But I know that’s not practical for most. The next option is to do pull-ups with a narrow, neutral (palms facing each other) grip. I’ve often talked about the benefit of pull-ups to build the biceps and some coaches scoff at the idea claiming that the stronger upper back will take over the exercise and biceps won’t grow. This is only true with pull-up variations that give the upper back muscles an effective line of pull. By placing your hands close together with your palms facing each other, your arm flexors are effectively targeted and the upper back can’t take over. I’m sure you’re familiar with the Double D attachment that you see sitting next to the cable stack in your gym. Grab that attachment with both hands and look at how close together your hands are – that’s the perfect hand placement for pull-ups. Perform 10 sets of 3-5 reps while alternating it with a chest or triceps exercise. The tricky part of a bent-over barbell row is that it’s very easy to mess up the exercise by leaning back or bringing your hips into play. Therefore, I recommend a more effective, user-friendly alternative. First, set an adjustable bench to a 45 degree angle. Next, lie face-down on the bench while holding a moderately heavy dumbbell in each hand. Start with your arms hanging straight down, palms facing forward, and row the dumbbells. This takes your lower body out of the exercise and ensures that your arms and upper back are doing the work. Perform 10 sets of 3-5 reps while alternating it with an exercise for your chest or triceps. 3. Standing Hammer Curl/EZ bar Reverse Curl: I’m not against direct arm training exercises. They certainly have their place, but many variations do next to nothing. The two best I’ve used in 17 years are the standing hammer curl and standing reverse curl with an EZ bar. For these exercises I like to use slightly higher reps: 6 sets of 6-8 reps works well. Again, you should alternate each set with an exercise that trains your chest or triceps. The essential component for getting the most out of your direct arm training exercises is to challenge your forearms. That’s why I highly recommend Fat Gripz. They fit around any traditional barbell, dumbbell, or pull-up bar and they work incredibly well to overload your biceps and forearms. 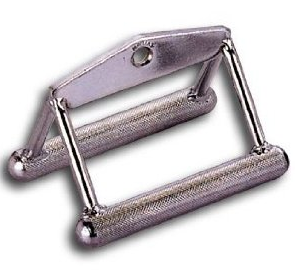 Fat Gripz are one of the best training tools out there. Just throw a pair in your gym bag and you’ve got an excellent tool to make any arm exercise more effective. 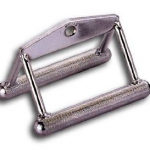 You can find Fat Gripz by clicking HERE. This entry was posted in How To Build Lean Muscle, How To Get Ripped by Dr. Chad Waterbury. Bookmark the permalink. CW: No, don’t do it wrong. For the two exercises in question, make the arms do the work. i’m not able to do pull ups no matter how i place my hands. would a pull down with a neutral grip work? CW: Yes, a pulldown with the V-bar will work. Great article as always Chad! Thanks for reminding me about the Yates Row I forgot about how powerful this is for targeting the biceps. Oh yeah and Fat Gripz rock too. This was a great post. I was NOT expecting to hear talk of neutral grips, ‘line-of-pull’ for upper back muscles, etc. DEFINITELY some good food for thought there. Oddly enough, at my previous job as a diver/oceanography tech, I had access to a scrap heap some 50 feet of 2.5″ diameter nylon rope, AND a crane to hang it from after work. I can definitely attest to how effective the rope climb is for building biceps and forearm strength. Before I left, I cut myself a few feet of the rope, and now use it as a portable pullup station, throwing it over any sturdy overhead object to get a few pullups in whenever I have the chance. As it turns out, I find that simple towel pullups (roll up a towel and throw it over a tree branch or beam) actually work the forearms even more than my rope, since the towel ‘gives’ more and requires constant pressure from all fingers. A towel for pullups, a wall to do some handstand pushups, and some stairs to run (or soft sand for that matter), what more do you need to get into amazing shape? Anyways, great post and great blog. I can’t wait to read more. CW: Good points, Ian. The towel pull-up works well, too. CW: Whenever you modify the technique by bringing in other muscle groups it takes emphasis off the muscle groups that exercise targets. Stick with perfect technique. ive got some underdeveloped arms and im looking to do you HFT total body workout again. id love to get the most out of the exercises so when i come out of the program 3 weeks later, i can have some decent guns to show. Any ideas on how i could throw these ideas into your routine you outline in you HIAH? you recommend rep schemes like 10×3 and 6×6-8 so how do i go abouts adding that into your HIAH style workout? CW: Don’t change what’s outlined in HIAH. Those parameters work. This info applies to other programs, not the HIAH workouts. Chad. Great post as always. I’m ‘stuck’ with my arms so will give this a go. Just a couple of questions. What rest periods do you use, if you’re alterating with triceps? Also, do you do all three exercises listed in a training session (ie 26 sets for biceps in total)? 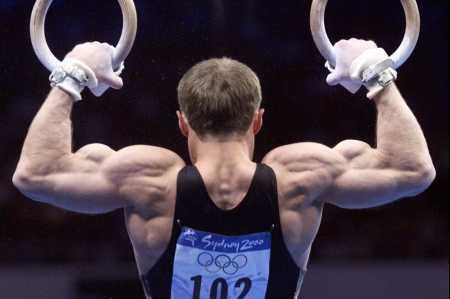 Finally, when you get some time, can you give us a post for triceps as well to really blow those arms up. CW: Generally, 30 seconds rest between exercises works well. Choose one exercise in this post for each workout. You’ll do 10×3 or 6×6-8 depending on the exercise. Huge In A Hurry employs 5X3 and 5X5 loading. Here you prefer 10X3 and in your TNation ‘Best Load For Hypertrophy’ article you recommend 24-50 total reps of a 5-6RM weight. 5X5 is of course within this range (at the low end), but it seems that for size and strength the progression is towards more total rep volume with heavy weights. Is this an accurate assessment? Also, you cite the lesser effectiveness of low weight, high rep, ‘pump’ sets. What are your thoughts on ‘constant tension’ techniques for biceps? Perhaps with higher weights? CW: HIAH doesn’t employ any specific set/rep scheme, instead it outlines a target number of reps for each lift. The estimates you mentioned are for the Get Strong phase where strength is emphasized over hypertrophy. In the Get Even Bigger workouts some workout volumes are lower but the overall weekly volume makes up for it. Bottom line: don’t change the HIAH workouts. The parameters mentioned in this post are for workouts that don’t follow the HIAH format. Can you substitute the rope climb with the rope pull with a prowler? If so how many reps and sets? CW: Yes. Do 10 seconds worth of maximal effort for 10 sets. i want to know what you think about concentric holds on rows and vertical-pulls for people that need postural corrective work or plagued with scapular instability, and how it works (reps and sets)? and if they can use rope climb, neutral grip pull-up, rows and overhead presses without getting wrong results because of the scapular instability and if not what the wrong results they can get and what effects scapular instability can do in muscles development? i really need to know what you think about this. CW: Yes, 3-4 sets of 10 second holds works well for that. A rope climb is advanced, so only people who are good at pull-ups should do it. If scap instability is a concern, stick with pull-up variations instead of the rope. Love it Chad, you know what people are looking for. Can you do one of these on calves? I had a look on here but couldn’t find a post on them. If I’m doing a full body circuit (say 6 sets of 5 or 4 sets of 10 ) of a press, a pull, a deadlift, and a plank, would it be better to add 2 more exercises (bicep and tricep) to the circuit, or to do a separate arm circuit after my normal workout? CW: Do a separate arm circuit. in the gym we have a neutral grip handles in the pull-up bar, but the distance between the two neutral grip handles is not as the V-bar its a little wider than that, a 4 inches (10 cm) wider, is that ok? i mean its close enough for the hands to be a biceps building neutral grip pull-up? CW: The HFT for Arms program in my book, Huge in a Hurry, is the best way. CW: 10×3 is great any muscle group that needs to get bigger. I know it is rather late right now but a quick question chad. Will the wide grip pullup and the neutrla grip pullup give the same or similar emphasis to the lats? Im looking to workout my lats mainly, but i have been told a lot of times that the difference in lat emphasis upon the lats during different grips of pullups (making sure you dont go toooo wide) makes little or no difference. CW: Yes, you can build big lats with a neutral grip. Research shows that a pronated, shoulder width grip is great too. CW: Usually, twice per week works well. Three times per week can be too much considering it’s the same exercises. Continue until progress stops, don’t have a set number of weeks – go until it stops working. For calves, I read one of Chad’s earlier articles that recommended one-leg hops while holding a dumbell. CW: Yes, that’s one of my favorite calf builders. 10×8 three times each week works well. CW: You can limit your Tuesday work to back/biceps but I suggest adding the deadlift to that workout since it’ll help you curl more weight. Do low reps deads followed by curls. Then do back work at the end. I’m confused I was originally thinking you meant to use the “double D” attachment which would leave my palms facing each other. With the “V bar” attachment which many people use for tricep extensions, my palms would be at a 45 degree angle or is that what I want? CW: Wow, I completely missed that error. You’re right, it should be a double D attachment. I’ll edit that right now.